Grown out of next-generation XTOMP technology, the Hotone Binary Series lets loose versatile pro-level effects in compact cases. Based on the same modeling/original effect library that amazed XTOMP users worldwide, Binary Series are dedicated to gather a bunch of high quality effects in a box with more affordable, competitive price. They feature compact casing, dual-footswitch design, versatile inputs/outputs and bright, clear OLED display, which blur the line between “classic pedals” and multi-effects. At the core of all Binary Series pedals, a powerful dual-DSP platform and CDCM (Comprehensive Dynamic Circuit Modeling) modeling system ensure a realistic playing experience. The CDCM system is built on an extremely complex dynamic variation matrix, able to realistically express every detailed change that occurs during the operational process of actual circuitry: Everything is ALIVE and performs like its original. 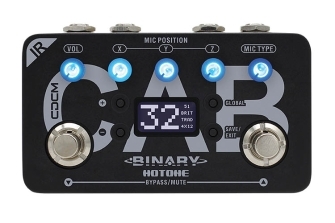 The Hotone IR Cab is an impulse response-based cabinet simulator effects pedal that delivers 100 authentic legendary (vintage and modern) guitar and bass cab models. In addition, the IR Cab features CDCM-based legendary studio microphone and power amp models, as well as a variety of detailed mic position (X, Y, Z) and room simulations.